I just adore our alphabet puzzle from Melissa and Doug-- it has been well-loved, but as with any other puzzle, it is easy to do it once and then forget about it as it becomes hidden at the very bottom of our toy closet by all the other toys and gadgets. A few months ago I gave it "new life" by adding the pieces to a simple sensory bin. This time, I wrapped the alphabet pieces in a product you probably have in your kitchen cupboard! Head on into the kitchen for your package of tin foil! 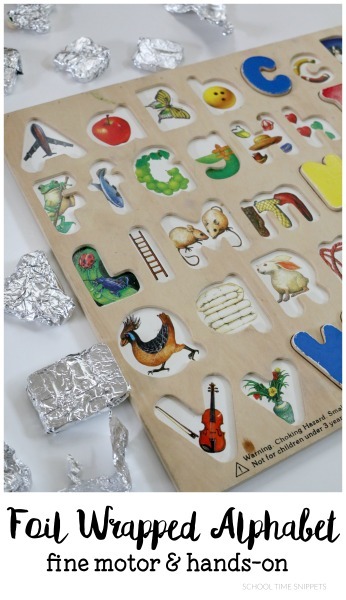 This hands-on activity is a wonderful and creative way to work on literacy and fine motor skills with your preschooler! 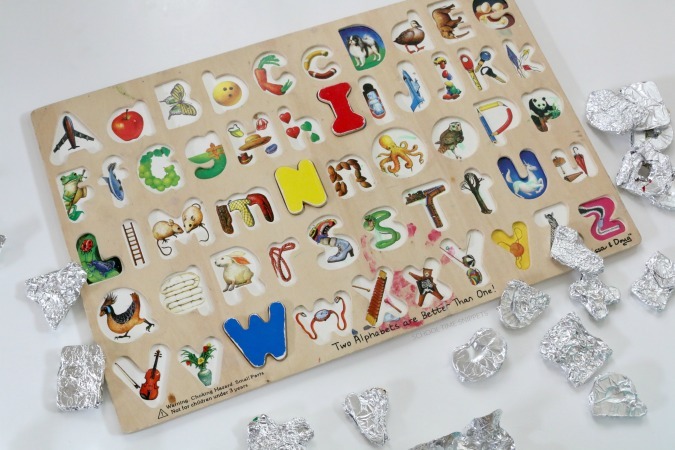 Work on letter recognition, beginning sounds, letter sequencing by using an alphabet puzzle and strengthen fine motor skills by adding the unique twist of tin foil to this creative activity. Not gonna lie, the prep work is a bit tedious but it is VERY simple. Rip off a small square of tin foil for each letter and wrap the letter in it. Do it again, and again, and again... until all the pieces are wrapped in foil. Once the activity is prepped, encourage your child to un-wrap all your hard work! Manipulating the tin foil is great for finger strength and dexterity. After your child has unwrapped the letter, work with your child to identify the letter and the sound(s) it makes. Place the letter in the correct spot. Continue until all the puzzle pieces have been unwrapped and correctly placed in the puzzle. Your package of tin foil isn't just for the kitchen! I hope your child enjoys this creative literacy and fine motor skills idea! The best part about this creative idea is that you can use it with any type of puzzle! .... hopefully your puzzle has less pieces than mine!